Not that it comes as a huge surprise, but only Google's Pixels, and the Essential Phone, are very good at covering Android's security updates on time. 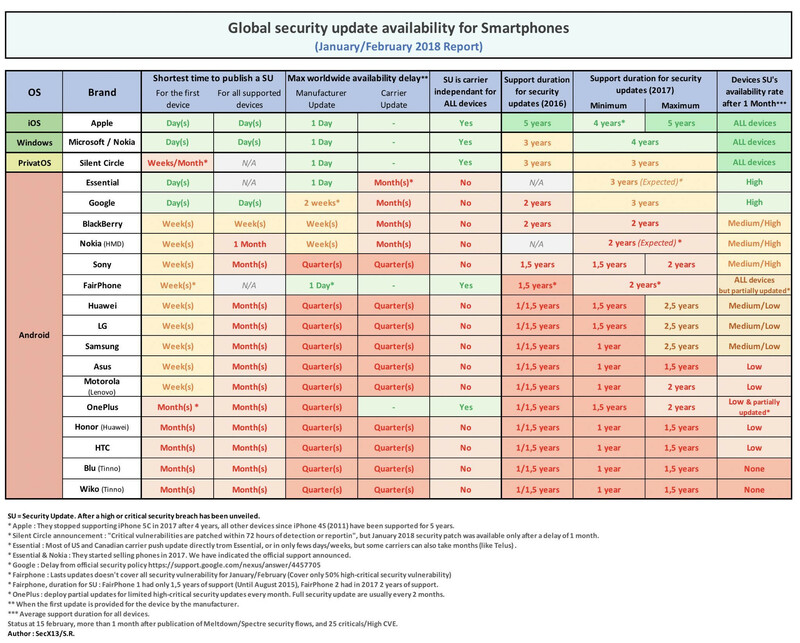 In the latest, February 2018 scorecard by research firm SecurityLab, the time to publish an update after discovering a vulnerability, or the maximum length of time before the update is available to all phones in a company's portfolio, reveal a pretty abysmal picture. As mentioned, it's just Google Pixel and Essential that are pushing security updates as soon as they become available, but, let's face it, the models from these two companies can literally be counted on one hand. We were pleasantly surprised by Nokia, whose stock Android comes right after Google and Essential, if we don't count BlackBerry, or specialized phones. With the newly-announced Nokia 7 Plus offering telephoto zoom, huge battery, and 18:9 display for sub-400 price, the Finns may develop somewhat of a cult following in the value-for-money segment, if they keep doing the right things. Samsung and LG are down the list, needless to say, with weeks to months between important security update rollouts to their far-reaching rosters. This image is so depressing. I was mostly okay with getting an update every other month (Samsung) but this looks really bad. Essential has been great with updates and they should be given props for that. Not even security updates that stop your phone being easily hacked? That seems like a rather ill-informed, not to mention dangerous, position to take. Actually you don't seem to KNOW if you have been hacked so far. For instance, you have no Ideea if a site you have been visiting was using your hardware to mine crypto currencies, yet there probably are a lot that did (and do, if you don't care and you have not updated your phone). As long as one circumvents the browser's security, it means one is hacking the smartphone. No, you just don't know if you've been hacked, but considering the level of ignorance you've displayed in your posts I think it's quite likely you already have been. How would you even know if you've not been updating your phone? Todays technology software support/update is half the story when it comes to smartphones,tablets, pcs, macs,etc. It can make or break one device thru support. Totally glosses over how well iOS updates are. It’s right on the picture. The article is about Android, not iOS. Why didn’t you mention how much better Windows is compared to Android? It’s right on the picture. I'm sorry, but this is kind of irrelevant, as every android flagship in 2018 is going to launch with Oreo, which means that they're going to have Project Treble support, which is completely going to change the way updates work on android. It's going to significantly speed up the process of updates, which means that this table won't even look remotely the same for 2018. I don't get the point of this article, now that the massive overhaul that Project Treble is, is becoming a common thing, as this table won't at all be representative of android in 2018 and onwards. The table is relevant to today. Android, and security don’t mix.